Choice of banner, medallion and personalization. Select an emblem: Army, Navy, USMC, Air Force or USCG. 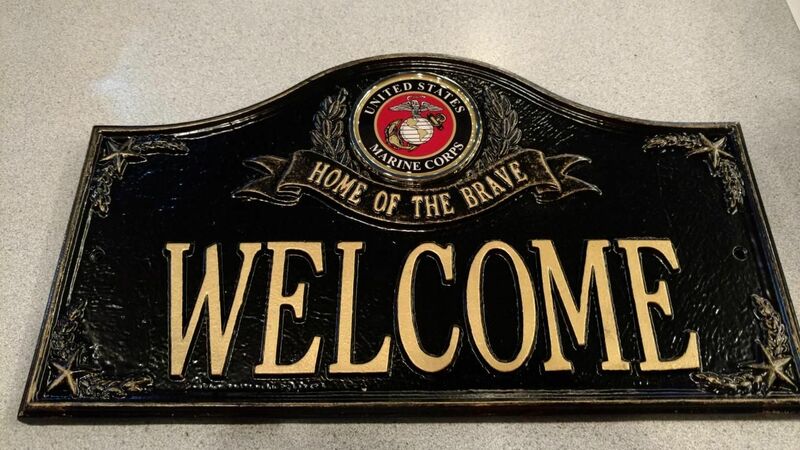 Under the emblem, select: Welcome, Home of the Brave, Military Family, We ﻿Support Our Troops, In God We Trust, Proud American. To personalize: one line of eight 3” characters or twelve 1.75” characters OR two lines: 18 1.25” characters on the first line and 16 1.25” characters on the second line. These are handcrafted with pride in the USA from durable, rust-free, recycled aluminum and finished in all-weather paints. $99.50 plus $15.00 shipping. Can be used outside or mounted in the home using the screws included. This makes a beautiful gift for any home. 16" x 9.5"